Why Travel, When The World Is Getting Scarier? The world is a scary place. It gets scarier each year. That’s why many of you may think that my wife and I are nuts. Next month we’re going to ride a tandem bicycle around Panama and Costa Rica. In June, we’ll cycle around Europe. We’ll explore Slovakia, Hungary, Croatia and Slovenia…because we’ve never been there. What’s the scariest thing in the world? It might be the media. News networks say that the world is getting hairier. Eyeball hungry media pull scary strings. Sometimes, vote hungry politicians do much the same thing. But the world has never been safer. I grew up in Canada. I watched U.S. television. Thanks to fear-peddling reporters, I was afraid of the United States. That’s where postal workers go postal. Kids walk into schools and open fire. People with Rambo style artillery go ballistic in movie theaters, universities and shopping centers. America’s own headlines had convinced me that the U.S. wasn’t safe. You couldn’t have paid me to move there. Today, I’m not afraid of the United States. I don’t let the media dupe me. I even married an American. She hasn’t hurt me yet. A Pew Research Center survey says that U.S. gun related homicides have dropped 50 percent over the past 20 years. In 1993, there were 7.0 gun related homicides for every 100,000 people. 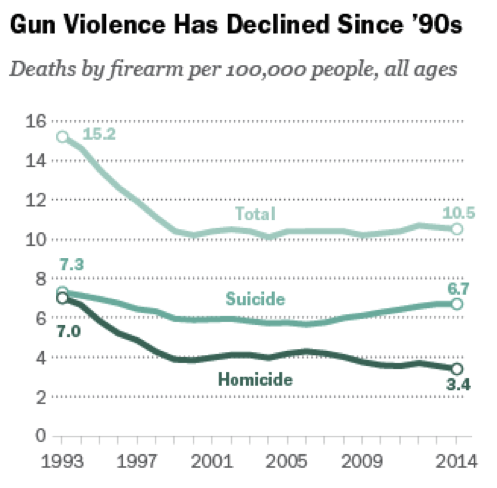 By 2014, that number had dropped to 3.4 gun related killings. Disastercenter.com compiled data from the FBI’s Annual Crime Reports. They listed U.S. homicide rates from 1960 until 2014. Murder rates, when compared to population, are at a 54-year low. What about deaths caused by terrorists? Americans on home soil are seven times more likely to be killed by lightning than by a Jihadist extremist. Over the past 10 years, International Security Reports say that such attacks killed 43 people. Lightning killed 315. Terrorists are hardly the biggest threat. Using numbers from the Centers for Disease Control and Prevention, 406,496 people died by firearms on U.S. soil between 2001 and 2013. Compared to most other countries, U.S. murder rates are high. The World Bank tracks homicide rates for 210 countries. None of the listed first world countries report more killings per capita than the United States. American homicide rates are still higher than in many 3rd world countries. But the United States and the world have never been safer. That’s why we need to ignore news headlines. We need to look at comparative data instead of Fox News or CNN. When it comes to global travel, the good old days are now. 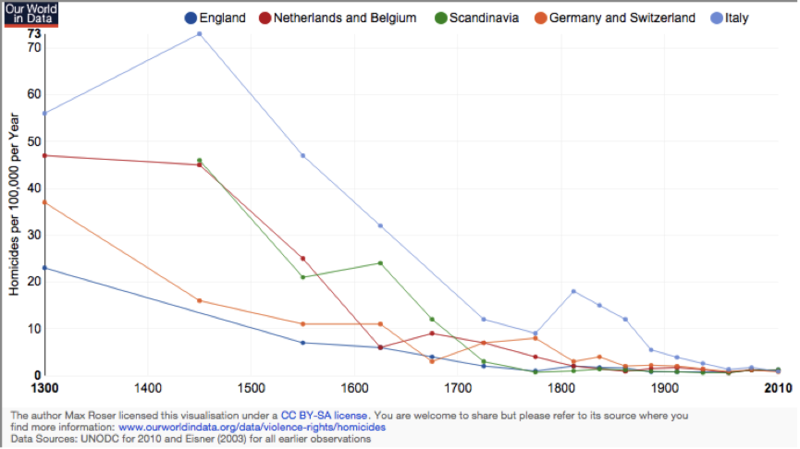 Global homicide rates per 100,000 are a fraction of what they used to be. Steven Pinker, is the author of The Better Angels of Our Nature: Why Violence Has Declined. He says that today is probably the most peaceful time in human history. 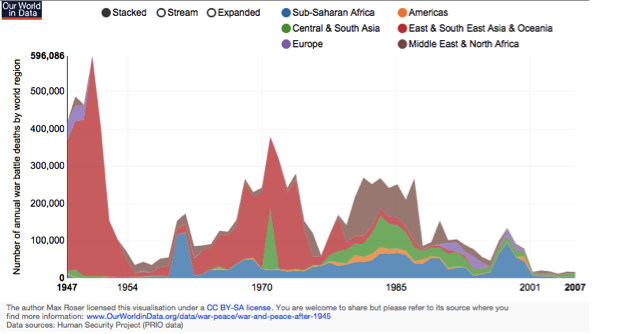 Referencing the Uppsala Conflict Data Program, Pinker says that the number of armed conflicts have fallen by almost 40 percent since the Cold War. 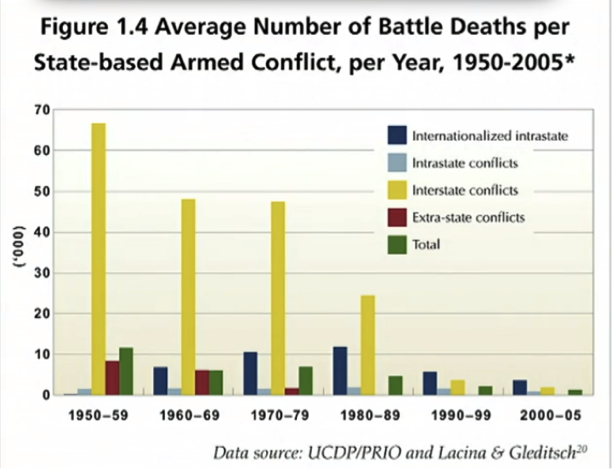 Battle deaths per conflict are also a fraction of what they used to be. Why don’t we see these reports? Researchers Marc Trussler and Stuart Soroka say that most people are drawn to negative headlines. They conducted a McGill University study, Consumer Demand For Cynical and Negative News Frames. Negative news draws eyeballs. Eyeballs draw advertisers. Advertisers draw money. war-related deaths have never been lower. In 2014, my wife and I joined an online organization called couchsurfers.com. Travelers can request to stay in members’ homes for free. We accept or decline their accomodation requests after reading their profiles and references. Last weekend, we hosted a couple of young psychologists from Uruguay. The media, in its quest for clicks and eyeballs, will keep trying to scare us. But the world has never been safer. If you do want to travel, pack your bags and do it. Life is short. The world is colorful. Don’t let the media paint your world a distorted black and white.